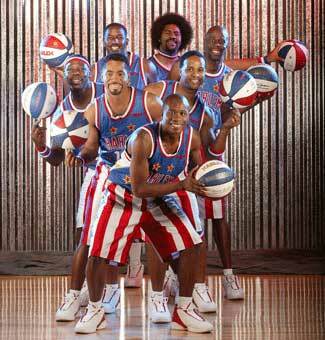 All Hail The Harlem Globetrotters! Filed to: Where's Gilligan?Filed to: Where's Gilligan? When we were kids, we were obsessed with the Harlem Globetrotters. We went to see them at the Assembly Hall in the mid-80s, and granting for the fact that the only real entertainment we had back then was running over G.I. Joe figurines with the lawn mower, it kind of blew our minds. We're older now, and so are the Globetrotters. These days, they're more a legitimate traveling team than a stunts and Washington Generals roadshow. And they even have their own draft. They took a few familiar names. • Anthony Atkinson, the guy who scored all those points to help Barton College win the Division II championship. • Sun Ming Ming, that 7-foot-9 Chinese guy who doesn't really known how to play basketball but is nevertheless obscenely tall. We doubt he does many dribbling tricks. • Brent Petway, a Michigan player who was not good, but could dunk. Not selected: Sebastian Telfair. Yet.